The Animated Woman: FaceBook whuuuut...? 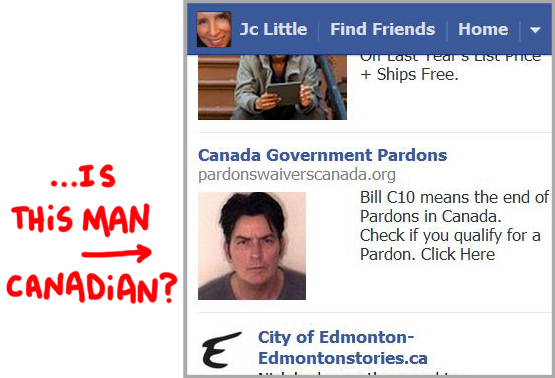 I opened my FaceBook and saw this face in the ad for Canada Government Pardons. Will someone please tell Charlie Sheen that the Canadian Government might forgive him!! Or maybe Charlie Sheen really is a Canadian? I don't know. But FaceBook finally got me to look at the ad section. Winning at jokes! Did FB just troll you? I gave up on the ads when I clicked once on an amazing pair of shoes just to realize it was a ruse to get me there & no such shoes were there. Charlie Sheen is just like those shoes. Dd they just imply you're going to need a pardon?! Charlie Sheen may not be Canadian, but you can have him. Please...take him!